Black Friday deal: Save 40% on Award-winning B&W speakers | What Hi-Fi? Hi-fi stereo speakers don’t get as much Black Friday sale love as wireless Bluetooth speakers and the like, but thanks to hi-fi retailers getting in on the action, there are some to lap up. And if you’re in the market for some midrange floorstanders, why not make the most of a £400 discount off an Award-winning pair? For Black Friday, Sevenoaks has discounted the B&W 683 S2 floorstanders to £749 (down from £1149) - a 35% discount. The retailer has also slashed £200 off the price of the 683 S2’s standpmount counterparts, the Award-winning B&W 685 S2. Both deals end on 26th November. The fact they are both Award winners (of various Awards between 2014 and 2015) gives you some idea of their talents. The 683 S2 floorstanders combine massive power and scale with delicate subtlety and nuance, and all things considered are tremendously talented speakers - even if they’re no longer at the very front of the sub-£1000 race. 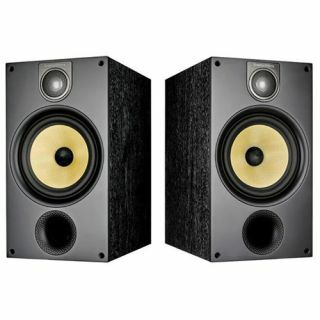 The 685 S2s have also been overtaken by superior speakers in the last few years - it’s even dropped a star because of it - but that doesn’t make them any less tempting in the face of such a heavy discount. For £299, they’re right back up their with the best-value standmounts for that money.